Romances set in small towns are all the rage now. It is a trend that I’ve quite enjoyed reading. Luann McLane’s WILDFLOWER WEDDING is no exception. It has all the classic ingredients that make these romances such pleasures to read. It takes place in a small town hit hard by the recession but that is determined to pick itself up, brush itself off and stand tall once again. I live in that kind of town. WILDFLOWER WEDDING’s heroine Gabby Goodwin is determined to make her mark in the town she grew up in by owning her own business. I happen to be a small business owner. Gabby runs a flower shop. My family owns a gourmet food store. Lucky me, I already have my happily ever after. Lucky Gabby, she’s about to get her’s. If she’ll open herself up to it. From the very start, you can’t help but want as much for her. Enter Reese Marino, the town’s bad boy (and Gabby’s secret crush when they were younger) who went away to live with his Uncle Tony in Brooklyn. (Score another point for me. I love Brooklyn having lived there myself). Reese has returned to town having straightened himself out and become a success in his own right. He and his uncle own the newly opened pizza place. It’s a second chance for both of them. He delivers Gabby’s pizza and she just thinks he’s nothing more than the delivery guy. A hot delivery guy but just the delivery guy; nonetheless. One of the many things I enjoyed about this book was that it was all about second chances. Gabby’s desire to get a second chance in her hometown at going from being from the wrong side of the tracks to being right on track. Reese coming into her life and getting a second chance at love with her. Recovering from the sting of a painful divorce, Uncle Tony gets a chance at finding love once again. Even Reese’s mom seems to get her second chance, too. For some, having so many secondary characters in one place removes something from the story. I would beg to differ. A small town - any small town - is made up of the sum of the people who live and work there. I know that everyone who lives where I do contributes a little something special to the makeup of my town. Cricket Creek is no different. All the characters in this book and everyone else from the other books in this series make it a vibrant, very real, very special place. Just like anyone else’s town they may live in. Just like mine. Yes, you can cue John Mellencamp if you like. Still, and all, what I loved most of all about WILDFLOWER WEDDING was how Gabby and Reese opened themselves up to the possibility of love - to the certainty of their own love. To me, the journey to their happily ever after keys into how deeply their love runs and how as beautiful as a field of wildflowers it can truly be. 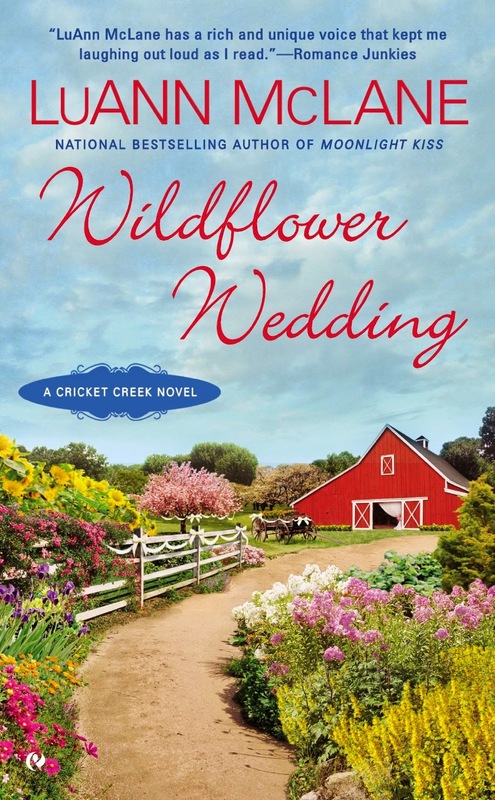 I highly recommend going out and getting your copy of WILDFLOWER WEDDING. I think you’ll enjoy it as much as I did. I know that I will be looking for the other books in this series, as well. Did you know they have their own baseball team? You know what’s coming, right? My town has our very own baseball team, too! Santa Byrnes has been in love with the written word for as long as she can remember. Romances provide reaffirmation that love is for anyone who opens themselves up to their own happily ever after. Santa lives in the beautiful Hudson Valley in New York along with her marvelous husband and three amazing teens. An aspiring romance writer, she is ever grateful to have found her own happily ever after. Readers, do you enjoy small-town romances? Do you like to read about second chances at love? Do you - or have you - ever lived in one of those small towns where "everybody knows everybody?" Does your town have its own baseball team? Thanks, Santa! I love small-town romance and this one sounds like a winner. I've read and enjoyed McLane's books in the past but haven't read her recently. I can see I need to catch up! This sounds like a wonderful addition to a series that I have enjoyed. I'm even more eager to read this one after your review, San. I too have read a few of Luanne's earlier books.. I grew up in a small city of 12,000 but everyone did know everyone. I like small town romance series: Jill Shalvis-Lucky Harbor, Susan Wiggs-Avalon, NY, Robyn Carr-Virgin River, Debbie Macomber-Cedar Cove. My hometown does have a small baseball team the Two Rivers Polar Bears as Two Rivers is the coolest spot in Wisconsin! I am among those who like small town set stories. They have their own special flavor and become characters of a sort in the book. There are disadvantages of everyone knowing everyone else's business, but they are balanced by how they can pull together when necessary. I grew up in a small town and now live in the country outside one. There are baseball farm teams in two of the neighboring small cities. I enjoy visiting large cities for all they offer. In my husband's military career, we were stationed in Colorado Springs, Sacramento, and Washington, DC. We took advantage of them when we lived there, but consider them a good place to visit. We looked to the country and small towns when it was time to retire. I will be checking out LuAnn McLane's Cricket Creek series. Thanks for the review.